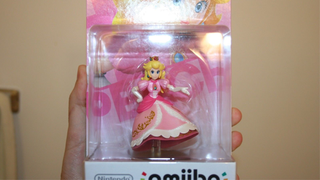 It's no surprise that rare toys can go for big money, but it's all the more surprising when it's a defective one that brings in the big bucks - especially from such a recently released toy like this Princess Peach Amiibo, which recently sold on eBay for just over twenty-five grand. Peach is missing her legs! Despite the fact your'e getting slightly less Amiibo than you should though, that's what's made the defective toy all the more desirable - factory sealed as it is, it's one of a kind. And with Amiibo's currently benefiting from a wave of excitement (a defective Samus Aran with 2 arm cannons recently sold for $2,500 on eBay), a bidding war escalated over the toy until the auction ended, hitting $25,100. It looks like people are getting more than a little silly in their bid to get their hands on Nintendo's latest toys.